It is said that good things come in small packages, and the Marathon Public Library is no exception to that rule. Under the guidance of library director Elizabeth Holt, this 723 square-foot library packs a punch with creative programming and community-focused resources. Marathon, TX has a population of roughly 430 people, and it seems Holt knows every single one of them. Her outgoing nature is well-known throughout West Texas, and her energetic nature powers this “off-the-grid” area where Big Bend and dark skies meet. Holt and the library team often play “library Tetris” as they transform the tiny space from science lab to tinkering workshop and from ice cream parlor to 3D printer makerspace. 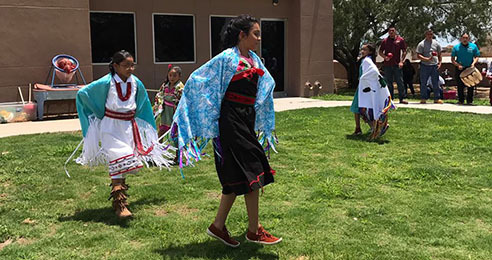 From the moment the Powered Libraries team walked into the Ysleta del Sur Pueblo (YDSP) Tribal Empowerment Library, we were immersed in the customs, traditions, and storied past of the Tigua people. Brenda Gutierrez, MarySue Femath, and countless tribal volunteers start from the ground up, teaching the basics of the Tigua language through their Tuy Pathu Pre-K Language program; elementary students make use of the library space to learn tribal dances and have access to books authored by community members that introduce and reinforce cultural practices, lessons, and Tigua language; adult members of the tribe also take part in full-immersion language lessons hoping that learning simple phrases and greetings will become part of everyday conversations on the reservation; and elders take advantage of the library’s central location to share the traditional bread baking techniques in an horno (outdoor oven, adjacent to the library) built by tribal youth. Just as the sacred drum symbolizes the heart of the Tigua people, this library symbolizes the heart of the Pueblo. The Northside Independent School District (San Antonio) employs a team of academic technology coaches who instruct teachers on using various technology tools—apps, websites, databases, etc.—in the classroom. Lucy Podmore of Clark High School works with coach Matthew Patt to collaborate on this objective, and also with principal Dr. Jerry Woods, who provides lunch for participating staff. About once a month during the lunch periods, the library hosts Lunch and Learn, a series of instructional sessions. 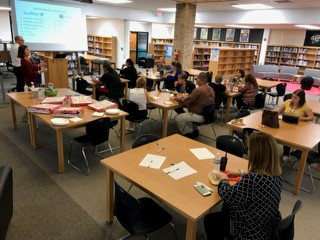 Recently, the library hosted a Twitter and TweetDeck session to help staff share their professional stories and better communicate their value to decision-makers. With a staff of over 200, teachers of different skill levels were split into groups of beginner and advanced Twitter users and were trained on how to use Twitter and TweetDeck to provide a consistent message about how they support their communities. The Lunch and Learn series offers teachers a valuable perk: in-depth paid training without leaving campus, all while eating lunch. Together, Podmore, Patt, and Dr. Woods form a powerful partnership to benefit campus educators. Superintendent Craig Nance wasted no time in showing the Powered Libraries team to the Science Library and delved into the singular history of the space, nestled underneath a high-powered telescope. 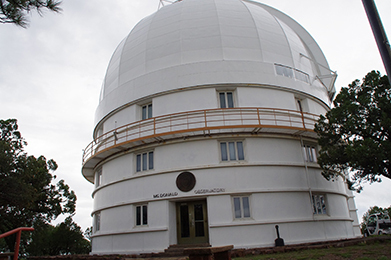 The Observatory Library is a star attraction serving academic researchers who gather information from scientific articles and publications to better understand the night sky and universe. The collection contains priceless planetary volumes, charts, and relics that spark curiosity. Gems include a rare book printed to commemorate the dedication of the Observatory, containing the signatures of the who’s who of astronomy during the early 20th century. Under Craig’s leadership guided by a can-do spirit combined with a quirky sense of humor, the sky is the limit. He is dedicated to exploring the public-facing future of the library as much as he is passionate about sharing the mysteries of the observable 200 billion stars in the galaxy. When the El Paso Public Library staff was tasked to bring creative incentives to the library system, Lisa Martinez introduced a Sow. Grow. ReapEat. program—inspired by other similar and successful community engagement opportunities hosted in New Mexico and Arizona. The seed library program empowers the El Paso community to plant a seed for a better future and learn about food systems. Master Gardener Jim Hastings from the Texas A&M AgriLife Extension Service-Travis County leads workshops at participating area branches, where he hopes his green thumb will sprout excitement in new gardeners. 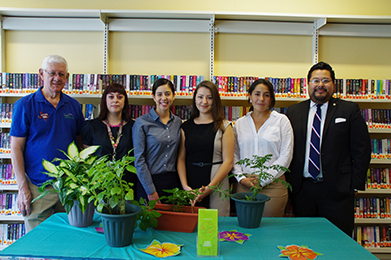 We extend a heartfelt thanks to Diana and Xotchil from State Rep Lina Ortega’s office and Richard and Stephanie from Congressman Beto O’Rourke’s office for joining the Powered Libraries team onsite at the main branch during filming. 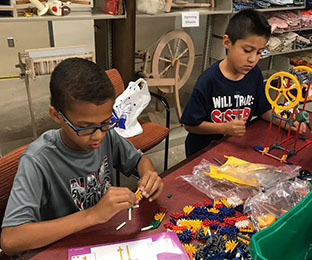 The Tom Green County Library System – Stephens Central Library’s STEAM Central is truly powered by partnerships such as the Texas Alliance for Minorities in Engineering (TAME), Angelo State University, local arts and craft organizations, and area-elected officials. In an industrial basement setting, the space generously offers access to video production equipment, tools, state-of-the-art robotics, quilting and craft supplies, and an array of engaging programming that charges the creativity of the visitors. The library, its team, partners, and community are an inspiration to the #PoweredLibraries movement. 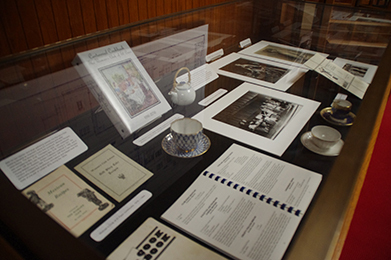 The sixth floor of the University of Texas at El Paso Library houses the S. L. Sonnichsen Special Collections Department, which features an impressive archival and photographic collection that tells the story of the people of the El Paso-Juarez region. Claudia Rivers and Abbie Weiser, Head and Assistant Head of the Special Collections Department, have established a community-focused approach to archival services. Through a partnership with the El Paso Times, the special collections team is able to put names with the faces of unidentified archival images dating from the 1930s onward. Resources can be accessed both online and in person, and reference staff is always available to help visitors put together the pieces of the past. Driving into the Midland County Public Library (MCPL) is like driving into an oasis in West Texas that feels like a children’s museum. Self-proclaimed as one of “techiest libraries in the state,” the Powered Libraries team asked MCPL to unplug, and they rose to the challenge by offering a series of no (low) tech activities that charge Midland’s communal batteries without plugging in. In one part of the library, an adult coloring group convened for their weekly meeting, where even their newest members expressed that they find therapeutic benefits in coloring, conversations, and meeting new friends. 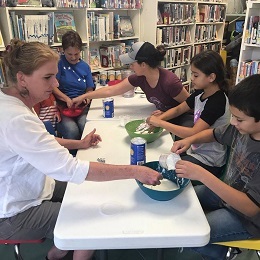 In another part of the library, grandparents volunteered a full day by assembling and sharing hands-on activities with kids; it’s a symbiotic service that gives retired community members an opportunity to get out and get involved and simultaneously offers mentorship to youth. 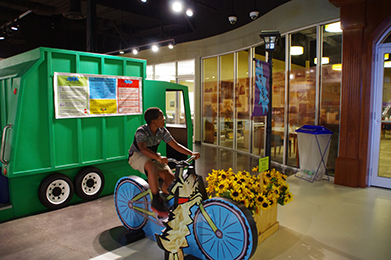 Taking up a third of the ground floor is a rotating exhibits area, which currently offers education crafts and unplugged games—from a farmer’s market to a recycling installation to a bike-powered station—emitting happy, rowdy sounds while breaking a few dated library stereotypes. 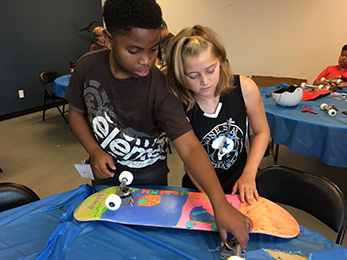 In partnership with the North Houston Skate Park and Clouds and Tricks Skate Shop, the Aldine Branch of the Harris County Public Library System provided a multi-day workshop for a dozen children to create their own skateboards and receive professional training in how to use them. With the success of the first week-long session in July 2017, the library received financial support from an outside sponsor to continue offering these workshops on a monthly basis through the end of the year. The children who register for the program receive daily snacks, art supplies, and high-quality equipment to assemble their own skateboard. With oversight from two skateboarding instructors and a librarian, the kids build the skateboard themselves. Once the boards are constructed and before skating into action at the local skate park, the instructors teach the young trainees about balance and foot positioning and share techniques on how to fall properly. As part of an initiative to make Fort Worth more bike friendly, bicycles may be checked out from stations located throughout the city. Riders may borrow bikes from one of the city’s 46 stations and then returned to any station close to their destination. 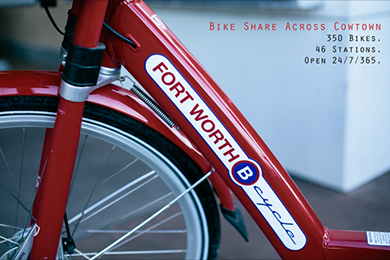 City of Fort Worth Library has partnered with Fort Worth B Cycle by adding one bike station at the Fort Worth Central Library and another at the Shamblee Branch. Learn more about this collaborative community project by viewing their website. The Austin Community College Library BatLab is a pop-up makerspace for all ACC students, faculty and staff interested in doing hands-on, real-world, multidisciplinary projects in an informal, co-curricular setting at the ACC Highland Library. The BatLab offers workshops and classes and also features kits available for checkout. 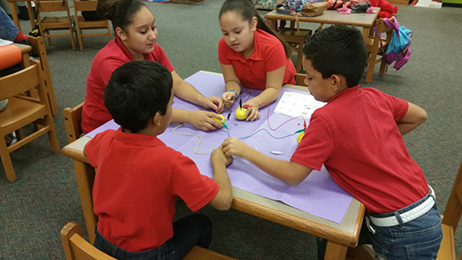 The 2017 Power Up Award (Branding Iron Category) was awarded to the Clinton Elementary School of La Joya ISD for its Lemon Battery Program. Read more about the program below, along with a question and answer session with the librarian. For the librarian Nancy Garza, it was gratifying to hear that the experiment made an impact. Powered Libraries asks her to share insight on the successful, school-wide event. How did you plan for and implement this project? Garza: While collaborating with a fellow librarian, we came across the Powered Libraries Event. We decided to look for a lesson that the kids would enjoy and impact their learning. We looked through several books and came across several activities, then we chose the lemon battery, because we knew the kids would be in disbelief that they could power up a light bulb without electricity. We purchased the materials and began testing the experiment. Garza: I collaborated with a fellow librarian Lisa Tanguma. She works for a neighboring district, and we like to plan together. We purchased all materials and began experimenting with different items. The experiment originally asked for lemons. We decided to try limes as well to see the difference in results. The results: we discovered that lemons generated more electricity than limes. What creative approaches did you employ to accomplish your objectives? Garza: A week before Power Up at Your Library Day (9/15/16), I posted a banner and a certificate outside the library letting kids and teachers know we were participating in the event. It struck the kids’ curiosity, and it also got the adults’ attention. Announcements were made the week of, and students started coming into the library to see what was going on. Due to the size of the campus and the amount of interest, the lesson was extended and lasted two weeks. That is how long it took to see all the classes that participated. Garza: I really enjoyed looking for activities that the kids would enjoy. Libraries are definitely moving in a different direction, and students are enjoying the activities they are experiencing. It’s not just “sit and read in the library” anymore. It’s experiment, tinker, create, and get loud and dirty in the library. Three years ago, Austin Independent School District’s Elizabeth Polk, Library Director, and Shannon Pearce, Acquisitions Librarian, founded the Buford the Book Bus program, an initiative that gives free books to Austin-area kids during their summer break. Children and teens are able to choose two free books, encouraging them to read during school vacation and avoid the “summer slide.” Shepherded by the Library Media Center’s outstanding librarian team and with support from local organizations and businesses such as Austin Assistance League, Austin Allies, Barnes & Noble, and High Road on Dawson, the program is a success. 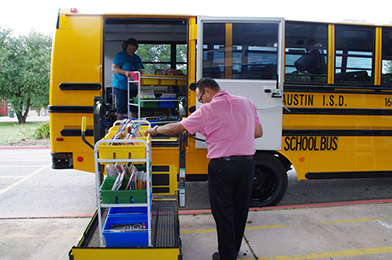 This summer, Buford the Book Bus along with 52 volunteers—who worked approximately 130 volunteer hours—distributed almost 1,200 books to over 550 kids at six locations in the Austin area! Their six stops included English Language Learning (ELL) summer school programs, recreation centers, Boys & Girls clubs, and affordable housing communities. 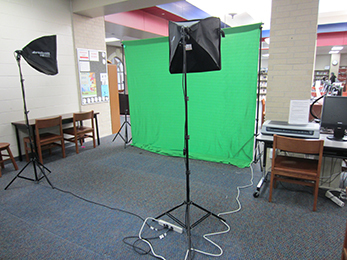 The Cypress Lakes High School library has a Makerbot 3D printer and a Green Screen Studio available to all students to use with Adobe Premier Elements or Adobe Photoshop. They recently added black and white photo backdrops to the Green Screen Studio so students can take portrait shots for use in composite photography projects where the green screen is not the first choice. The library also stocks two “make-and-take” workstations with colored paper, markers, color pencils, a printer, a scanner, and some other supplies for 2D projects. In addition, they have a giant chess set (8” king), giant checkers, and a jigsaw puzzle on tables so students can practice strategy and spatial problem-solving. Students may come in as individuals to access the spaces, or their teachers can reserve a space for a special project. For more information, call 281-856-3800. 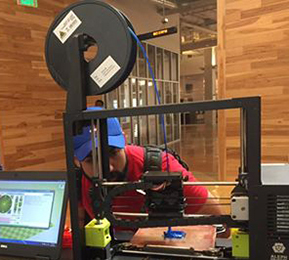 After a year of gathering input and planning, the Parish Episcopal School (Dallas) celebrated the opening of its humanities makerspace in the main library. Two years prior to this event, the school created a large Design Den to serve as a makerspace for the Science, Technology, Engineering, and Math (STEM) programs. This initiated a discussion among the English and history teachers about makerspaces in the humanities areas. They agreed that the library serves as a makerspace for reading, writing, and research. With this in mind library leadership set out to make the physical library more collaborative, flexible, and conducive to project-based learning, meeting several times with teachers, department chairs, and administrators to gather ideas. This library serves grades 5-12, and the needs of middle school and upper school are very different. On an average day, 60-70 of our 400 upper school students come to the library seeking a quiet place to study or read. The library ultimately created two glassed-in rooms to offer multiple areas that could be used at the same time by more than one group and still maintain the atmosphere of quiet study desired by the students. The IdeaLab is a classroom-sized glass room with 20 Essay desks with casters to facilitate easy grouping. There is a 70′ TV with a docking station, and large areas of writeable white space. The IdeaLab is ideal for mini-lessons, brainstorming, group projects, and presentations. 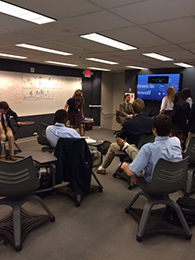 The collaboration area is a smaller glass room with a tech table in a horseshoe design that seats seven people. Four different devices (Mac laptop, PC laptop, iPhone, or iPad, for example) may be hooked to the table for display on the 60″ screen. Cables allow easy toggling back and forth between devices. The collaboration area lends itself to small group collaboration, teacher/department retreats, meetings, and presentations. All furniture in the library is on casters, allowing for flexible and collaborative grouping. Three charging bars in various parts of the library give access to easy charging of student devices. The Innovation Lab connects regularly with schools, local maker groups, and other organizations both near and far. Recently, the makerspace staff and volunteers were privileged to assist with the 3D printing and construction of a prosthetic hand for a little girl.